These seed are also sold coated with an organic coating to help with planting by adding color so they are easily seen against the soil. If interested, click the link at the bottom of this page in "Related Items". 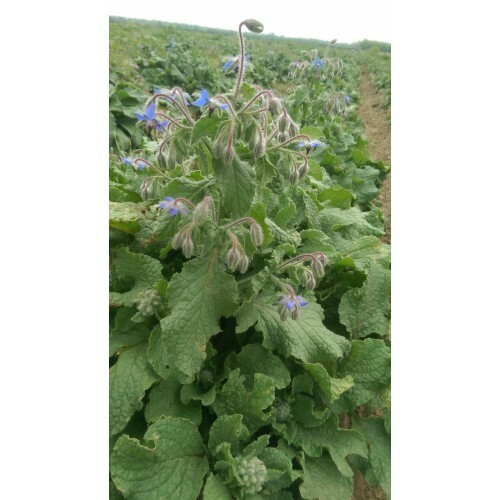 Borage is an annual herb in the flowering plant family Boraginaceae. It is easy and fun to grow. Bees and other pollinators frequent it all day. It can yield over 60 lbs of honey in a beehive per season! Borage seed contains 26-38% oil. This oil is 17-28% Gamma-linolenic acid. In Europe, there are several dishes that Borage compliments. Italian Liguria is just one of these dishes. Borage is used to treat hyperactive gastrointestinal, respiratory, and cardiovascular disorders. It also helps with kidney and bladder issues. Plant Date: (Indoors) 6-8 weeks prior to last frost (Outdoors) just after last frost date. FREE SHIPPING!The seed in this listing are coated with an organic coating and colored so they are ea..